Major bulk material handling solutions Martin Engineering has gained the EAC Mark of Conformity (aka, Eurasian Conformity Mark) for the export of conveyor products and material flow aids, including the company’s full line of impact cradles, belt cleaners, sealing systems, air cannons and sonic horns. The important certification allows the Martin Engineering business units in Germany and Russia to offer the company’s extensive product family to the Customs Union (Russia, Belarus and Kazakhstan) and assures that the equipment is compliant with the EAC’s strict safety and quality standards. This will provide companies in the region with safe and efficient components for improving productivity, controlling fugitive material and clearing accumulation in chutes, silos, kilns and ductwork in a variety of material handling applications such as mining, coal, cement, biomass, aggregate and fly ash. Martin Engineering has built its line of conveyor products with a commitment to making bulk handling equipment cleaner, safer and more productive. The company specializes in solutions for difficult applications, such as today’s longer, faster and more heavily-loaded belts. Components are designed to mitigate severe impacts and direct the energy of a fast-moving load to control spillage and minimize dust, reducing risks and wasted clean-up time while improving overall system efficiency. Also designed for durability under extreme conditions are flow aids such as Martin Air Cannons, which are becoming the technology of choice for industries across the six continents the company serves. Powerful shots of air dislodge adhered solids and fines from vessel walls, ductwork and components, introducing the material back into the process flow. The rugged construction of the air cannons is well suited for harsh operating conditions, including extreme process heat and ambient temperatures as low as –50°C (–58°F). To facilitate set-up and use, Martin Engineering has confirmed that all certifications and documentation will be provided in the Russian language. 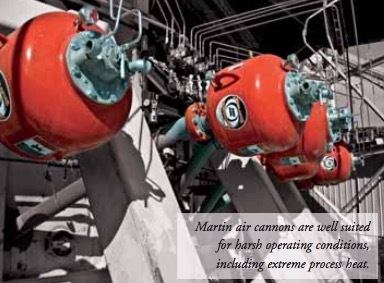 Customers will be able to purchase air cannons from Martin Engineering Europe, allowing export to Russia. Reducing workplace risk is a focus of the EAC Mark of Conformity, assuring the “safety of machinery and equipment,” particularly when “used in an explosive atmosphere,” such as the many types of cramped spaces filled with volatile dust found in bulk handling systems. Preventing clogs and piling by keeping material flowing is a key to safe operation and to avoiding the need for workers to enter chutes to perform unpleasant and potentially dangerous maintenance.